Just about everyone worries about their facial skin. Let’s face it (yes, pun is intended) . The first thing that people notice is a person’s face – is there skin glowing, is there jaw line chiseled or do they have a double chin, does their complexion glow or is it dull looking? 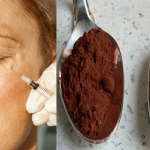 Many of us wish to get rid of wrinkles without paying big bucks for Botox. Did you know that a new Japanese research has proven the yoga exercises are effective for firming your face and neck muscles? Yoga facial exercises will leave you with glowing skin, firmer and stronger facial muscles, and even reduces wrinkles and lines that nobody wants. Of course, this does not happen overnight! If you start yoga facial exercises today, you will see results in a matter of two weeks. Two weeks! Best of all yoga facial exercises do not cost a penny compared to expensive, painful Botox injections. 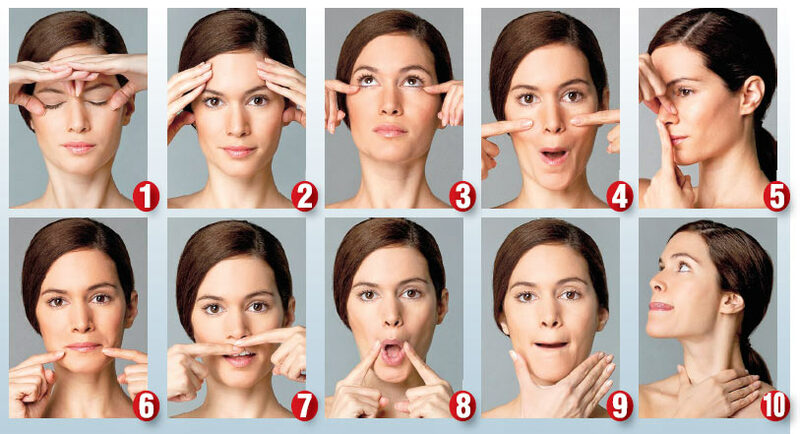 It is important that you do these facial exercises 2 to 3 times a day. You do not have to be in your bathroom to perform the exercises; they can be done while you drive to work, while you watch TV, while you read a book, and even why you take a shower! Did you know that keeping your chin up will literally prevent your face from developing jowls? For this exercise, you must tilt your head and neck all the way back, put your tongue on the roof of your mouth, and hold for 30 seconds. Repeat 5 to 6 times. 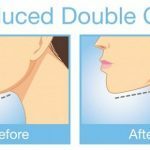 Doing this will firm your jaw and neck line, which prevents sagging! Many of us have worry lines that are well earned. Now it is time to reduce their presence! You will need to place your fingers on your forehead, directly above your eyebrows (as your fingers are on your forehead) close your eyes, and slowly move your fingers upward towards the top of your head. Press firmly as you move your fingers. When your fingers reach your hairline, it is time to open your eyes wide and raise your eyebrows high. Then slowly move your fingers back down to your eyebrows. This needs to be repeated 10 times. This exercise works because exercising your facial fontails muscle is extremely important to reduce the appearance of those well earned worry lines! Over time, every woman will come to a time in her life where the area above her upper lips will lose its elasticity, which leads to those tiny little lines well known as “smoker” lines. This happens even if you have never smoked a cigarette in your life! This exercise will prevent those lines from appearing and significantly asking for attention. You need to tightly stretch your upper lip over your top teeth and smile, hold this position for 5 to 7 seconds, and then repeat. This needs to be repeated it 3 to 6 times depending upon the severity of the “smoker” lines. This may sound silly but it actually works because it elongates the muscles around the mouth that help you to compress your lips making them resistant to wrinkles. Seriously, who likes wrinkles? Everyone squints from time to time. Did you know that squinting will pull the corrugated muscles that are between your brows together? If a person squints often enough, eventually the corrugated muscles will stay that way! The good news is you can smooth them out without a needle or Botox. You can reduce the appearance of frown lines naturally with the yoga facial exercises. For this exercise, you need to furrow your eyebrows intensely far more than you typically would. This makes your frown lines become deeper and firmer to the touch. If you are unsure if you have done this correctly…. Simply rub your fingers over your lines, and make sure that you can feel them significantly. Once you have done this correctly, you need to place your fingertips at the inner edge of each brow and then slowly pull your lines apart. Hold this position for 5 seconds and then relax your face and repeat the entire exercise twice. Annelise Hagen, the author of The Yoga Face states that if you do this exercise in front of a mirror that you can actually see your lines erasing! According to Hagen, this exercise works because while we maximize the muscle contraction causing these lines we are actually stretching and strengthening the muscles which will lead to softer and less noticeable lines. Even if your dream is to have prominent cheekbones, there is one thing to remember — you need to have a little fat on your cheeks! Why? Because a little bit of fat on the cheeks instantly radiates youth! Over time, it is common for most of the fat that surrounds and cushions are cheekbones to disappear, which will lead to a thinner, bony looking appearance. Not many people wish to look like a skeleton! 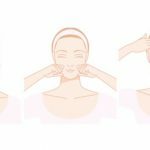 This facial yoga exercise is simple to perform, just like the rest! You need to take a deep breath and hold all the air inside your mouth, puffing out your cheeks as if you were playing a trumpet. The first few times you may want to do this in front of a mirror to ensure you have enough air in your cheeks. Do not open your mouth, and switch the air from cheek to cheek, alternating between left and right until you run out of breath. You will need to repeat this at least three times. This exercise works because it stretches and tones three different muscles that surround our cheekbones, according to Hagen. Have you noticed that people who play brass instruments commonly have fuller and youthful looking faces? This is because they are constantly exercising their cheek muscles! Who knew that by holding your breath could lead to a youthful appearance? If you are like many Americans who drink coffee in the morning, and even throughout the day –you will have an abundant amount of coffee grounds. Forget about purchasing expensive facial exfoliates and all over body scrubs, instead use a handful of your leftover coffee grounds to exfoliate your face and scrub your body. Moist coffee grounds remove dead skin cells from our face, but not only that, they help tighten and firm our pores resulting in our skin to have an incredibly smooth appearance and feel. If you have a dry skin, you may want to add 1 to 2 tablespoons of cold olive oil to your coffee grounds before applying to your skin. This trick is simple, but easily forgotten. Many women wear makeup on a daily basis but never wash their makeup brushes and sponges. Dirty makeup brushes and sponges are full of bacteria and grime. Rubbing the brushes and sponges all of your face simply cannot do any good. Wash all makeup brushes, sponges and tools once a week with a small dash of shampoo and warm water. After you have preformed the yoga facial exercises, exfoliate your skin with the coffee grounds, you may want to use other natural remedies to improve your facial skin. Did you know that the inside of a banana peel can be used as a facial moisturizer? Simply scrape off the innards of your banana peel, apply it to your face, and allow it to sit on your face for approximately 15 min. and then rinse. Do not stop there! Bananas are not the only fruit that naturally provides benefits for facial skin. Potatoes help reduce puffiness while citrus fruits such as oranges, lemons and grapefruit’s provide powerful astringent properties, avocados plump up your complexion, and pineapples will instantly brighten your skin. Remember to always use the inner, fleshy part of the fruit or vegetable! Yoga facial exercises, coffee, fruit and vegetable moisturizers all aid in creating the perfect facial skin but let’s not forget about cleaning our pores, boosting our circulation, and flushing out toxins. It is important to fight acne with a weekly steam facial! You do not need a fancy steam machine or to schedule an appointment at a spa in order to properly have a facial steam. You have all the equipment in your home! The only thing you need for a weekly facial steam is a pot of water, a stovetop, and a towel. If you will love aromas and fresh herbs, feel free to put a handful of lavender, vanilla, chamomile, or any other herb of your choice in the water. Simply bring the water to boil. Reduce the heat and let it simmer for approximately 5 to 10 min. then place the pot of hot water on your kitchen table or countertop, and gently drape a towel over the back of your head, carefully lean your face over the steaming pot of water. Be careful not to place your face too close which could cause you to burn yourself! Stay in this position for roughly 5 min. and then finish your facial steam by rinsing your face with cool water, which closes pores. DON’T JUST READ…go and implement what you just learned today because it works!! !